With adventure there comes a certain amount of risk. When we lived in the big house in rural Michigan for over 40 years we never locked the doors. Even when we were gone. Now we live in unfamiliar neighborhoods with dwellings only a few yards apart and we lock every time we leave for more than a trip to the mailbox. Maybe we don’t need to – campers tend to watch out for each other – but we don’t know the area well enough to know how safe or unsafe we are. On the other hand, most of the parks we have stayed in are gated communities and have prepared for every scenario to ensure the safety of their clients. One of the things that old people want to know about their community is where the nearest emergency room is. It can be inconvenient to drop in to the nearest urgent care facility and not have access to your medical history. Searching for a dentist when you chip a tooth a thousand miles from your hometown can be a challenge. Stores and restaurants are usually not a problem any place in America. Even on our epic drive to Alaska last summer, we were able to pick up basic foods at a local convenience store… at twice the price, of course. The nearest supermarket was 125 miles north of us at Fairbanks. Access to viable internet and television signals can be a bit less handy. Back home you subscribed to cable or satellite link-ups and then forgot about it for two years. Not so with the mobile life. Thankfully, in every campground there are veteran RV-ers who can help you find the nearest and strongest providers who will keep you connected. Month-to-month and without a contract. Cool. Stuff requires maintenance. It doesn’t matter whether it’s a hobby farm, a condo, an estate, or a travel trailer, stuff has to be serviced from time to time. The convenience of the RV life is that there is much less stuff to maintain. The house is smaller and that means less vacuuming and mopping. The yard is non-existent, so there is no mowing (unless you are a work-camper) and no mower whose blades have to be sharpened. You have left the keepsakes in storage along with the cupboards and bookcases that housed them, so there is a minimum of dusting. But the RV needs the wheel bearings greased every few thousand miles, the rubber roof needs to be re-treated every 2 years, and the siding, if it’s fiberglass, needs waxing every couple of years. 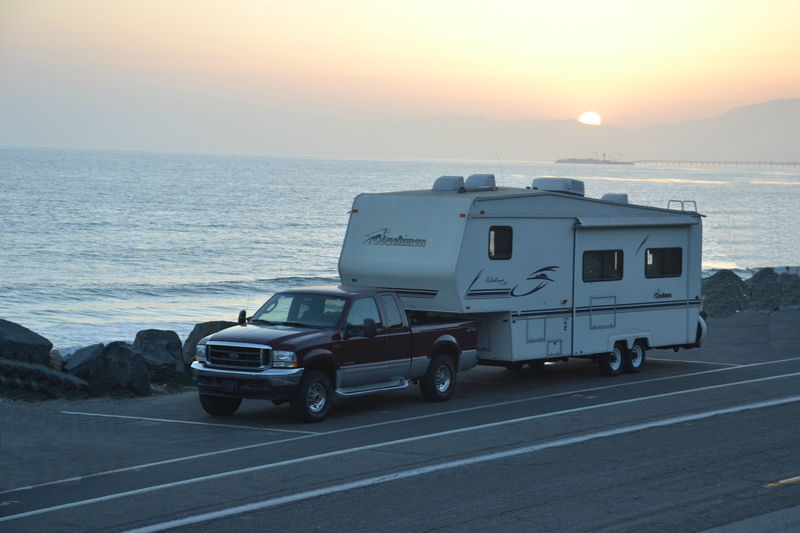 The truck or motor home engine needs the usual oil changes and tire rotations. The propane tanks need filling every now and then (more often in the wintertime) so you will need to locate the nearest filling station. One of our biggest inconveniences is that we are away from our kids and grandkids for long months at a time. We have never been homesick because our home is with us, but we do miss the grandkids every now and then. When they are young they grow from one phase to the next quickly, and we feel like we are missing out. The FOMO factor kicks in (Fear Of Missing Out). For Kaye and me, the thought of having a pet with us is not worth the inconvenience, but we are surrounded by pet-owners who are making a go of it. One of their biggest challenges is making sure their pet doesn’t become an inconvenience to their neighbors. A yappy dog quickly becomes a very unpopular thing in the middle of the night in a campground. Most of the pet owners we have seen are really good about the essential inconvenience of picking up after a pooping dog. I cannot speak to the challenge of the young family who pursues the traveling life; we see very few who are doing it. The few that we have encountered are home schooling their children, of course, and that presents its own challenges, but location doesn’t seem to be a problem. In fact, it’s the only way to educate your kids on the fly and it can be done anywhere. We met a family on the beach in Alabama that was sailing the high seas with the kids in a sailboat. Maybe they wouldn’t do it forever, but they were certainly building an unforgettable educational experience while the kids were young. If your pastimes include road tripping, sightseeing, hiking, farm marketing, campfire cooking, reading, photography, or “collecting” lighthouses or waterfalls or new friends, you are in luck. The mobile life will accommodate all of these and lots more. If, however, you amuse yourself with carpentry, pottery, classic car collecting, or welding, you may be up against a bit more of a challenge. I have managed my interest in carpentry by doing it seasonally. When I am back in Michigan every summer I get my portable workshop-in-a-utility trailer out of storage and build the latest book shelf for my kids. If they need some project done in the house, they just know not to ask for it in the winter when I am wandering around the south or in the tropics. Come summer, I will back into their yard and open up my mobile workshop and fix whatever needs fixing. I am also a musician and have my piano on board with me. Last winter in Alabama I found a campus band to play along with, and one guy even had an entire recording studio set up in a tent next to his RV. How about that. The trade-off for the inconveniences of the wandering life is the rewards that it offers, and that’s really the reason why most of us are doing it. We want to see new places, meet new people, try living somewhere else in the world for a while and see what it’s like. We are tired of the old place, we are tired of the cold winters, we are tired of feeding and weeding and mowing the lawns and trimming the shrubs. There are mountains to be climbed, there are beaches to be combed, there are forests to be hiked and ocean sunsets to be enjoyed. We are not waiting any longer to get there. Inconveniences be damned, we are going for it! The sun sets over the RV on the shore at Seacliff, California, a boondocking site (no hook-ups). Are you thinking about going for it? Trying to weigh the risks with the rewards? Will it be worth it? You know what? You won’t think of everything. And that’s all right. Relax. Prepare for it the best you can, talk to people who’re doing it, read blogs like this one. But don’t let fear of the unknown be a roadblock to your new adventure. The worst inconvenience of all would be getting to the end of your health – or your life – without the satisfaction of having pursued your irresponsible dream of the traveling life, the way of the vagabond, the beach bum. If you don’t like it or it turns out to be more inconvenient than rewarding, you can always go back to the former life with its security and its predictability. Either way, have fun! 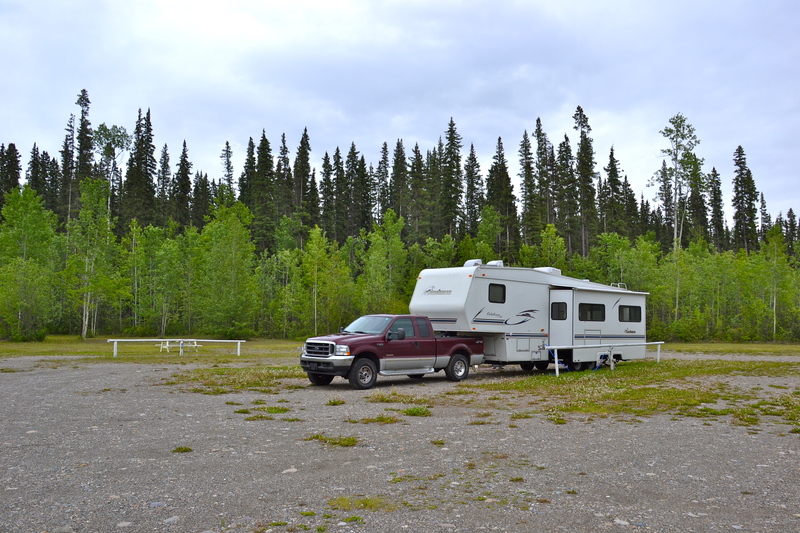 This RV park at Coal River, Yukon, was 100 miles from the nearest power grid and was operating on its own generator. There was no internet, but if we wanted solitude we were in luck; we had the campground to ourselves for the night.